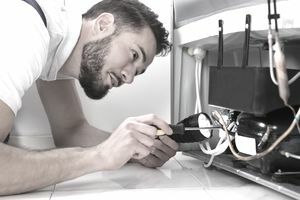 Home ownership comes with an endless list of things to fix, improve and put together, and finding the time to get it all done is a common challenge for homeowners. Plus, some of the items on the typical homeowner to-do list may require more than your average do-it-yourself knowledge. If you have a well-rounded knowledge of how to fix things, starting a business as a handyman can provide you with a great business opportunity and a chance to help struggling homeowners finally get their homes in order. Your startup costs are low if you already have the tools and equipment needed. It's an excellent business to start on a part-time basis. You have the potential for high profits. Your overhead expenses are generally low. Word-of-mouth and referrals are great marketing tools in this business. There is an opportunity to specialize, such as working exclusively with real estate agents, or on home remodels. You can focus on commercial and/or residential services. You need to be in good physical condition. Licensing requirements in some areas can be challenging because you must meet certain criteria. It can take some time to build a profitable client base. You need thorough knowledge and experience in all aspects of home construction, remodeling, maintenance, and repair. You need a comprehensive set of solid work tools. You may need a business license, liability insurance, and in some areas you need to be bonded. You may need a contractors' license.